When graduates of the class of 2014 accept their diplomas this year they will leave their college campuses with the unique and unfortunate distinction of racking up the most student debt ever recorded—a title that could not only have haunting effects on their futures but the overall economy’s as well. Among this year’s batch of college grads, borrowers will owe an average $33,000, according to a new estimate by Edvisors, an education marketing firm, which used 2012 data to make projections for the class of 2014. If these figures hold true, borrowers will have the highest average debt on record—more than double the amount held by students 20 years ago after adjusting for inflation, The Wall Street Journal notes. As the average amount of debt per borrower continues to climb from year to year, so does the number of people taking out student loans. 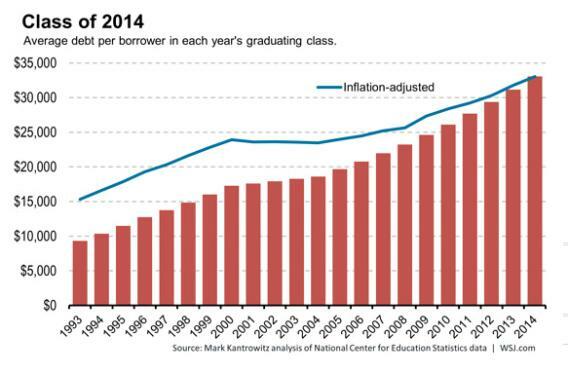 Today about 70 percent of student carry student debt, compared to 45 percent in 1993. Economists suggest the rising outstanding student debt—which topped $1.2 trillion in 2013 -- has adversely affected consumer behavior -- prompting some young people to delay making large purchases on things like cars and houses. “Having student debt can affect major life choices such as starting a home or saving for retirement,” said Lauren Asher, the president of the Institute for College Access & Success. A recent analysis by the Federal Reserve Bank of New York’s Liberty Street Economics blog suggests student loans are already hampering the housing market—a major driver of the economy. The study found that a smaller portion of 30-year-olds have mortgages than any other time in more than a decade. About 22.3 percent of people ages 27 to 30 without student debt had mortgages, one percentage point higher than those paying back college loans. That’s compared to 2011, when a quarter of people in both groups had home loans, the analysis found. Researchers caution that there are a number of reasons contributing to the decline in young homeowners—including limited access to credit, lowered expectations for earnings and the job market. Asher suggested that even the perceptions of housing as an investment might be very different among this generation of young people. A separate study by Pew Research found that college grads under 40 with student debt have a significantly lower median net worth than those who didn’t take out college loans. The average net worth of graduates with student debt is just $8,700 compared to $64,700 for the same group without college loans. The study also found that people who had student debt were also more likely to have other forms of debt like credit card debt and car loans. College grads under 40 with student loans had an average total debt of $137,010, compared to $73,250 for those carrying debt without student loans. “College grads with student loans are benefiting from higher incomes because of their degrees, but about four in 10 borrowers are weighed down with a substantial amount of debt that extends beyond student loan debt,” Richard Fry at Pew said. Still, despite the spate of studies highlighting how many people are saddled with student debt, education experts say the climbing cost of college far outweighs the alternative of not going. “Data confirm over and over that college, on average, is the best investment you can make in your life,” Asher said. However, she cautioned that there is a wide variation on student borrower outcomes—for instance, it depends on how much a student borrows and whether or not they complete school. “It’s important that if you do need to borrow you borrow in the safest way,” she said. A Pew research poll from earlier this year found that the median income for a household headed by a graduate under 40 is $57,941—twice the average $32,538 for those not holding a bachelor’s degree.